My first day on the job at Kohls was Thanksgiving. 2 years ago, and just a few months out from stepping away from a full time youth ministry job, I decided to take a part time job at the retail giant to make some extra cash for Christmas. I did a few training shifts in the week before the holiday but my first official shift on the register was Thanksgiving night at 8 PM. 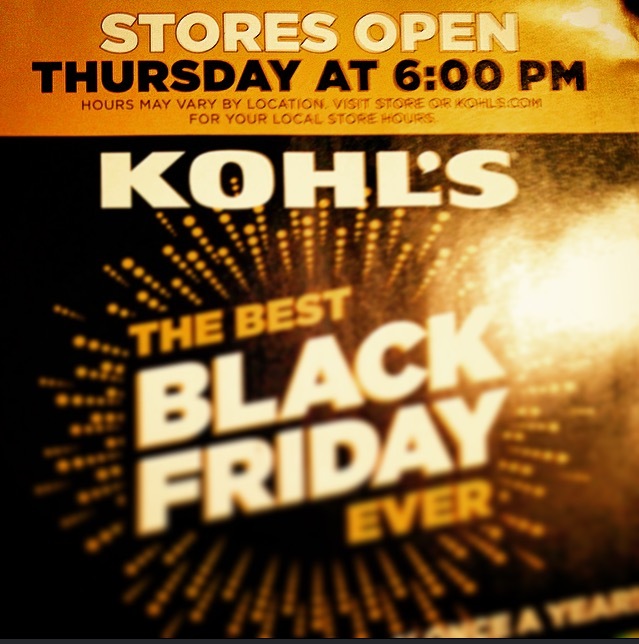 This was the first time Kohls and many other stores would actually be open on Thanksgiving night itself instead of opening in the early hours of Black Friday – a trend that is only continuing to grow. I remember staring at the clock at dinner that night, counting down the hours, dreading the moment I would have to leave the pumpkin pie behind to go risk being trampled by a sea of crazed customers busting down the doors seeking half-priced Keurigs. I only worked a four hour shift that night. But it felt twice as long. The customers never stopped coming. And I was back on the clock at 4 PM the next day for another 8 hour shift, and then again the next day for the same. Over the past 13 years I’ve worked my fair number of jobs, and that Thanksgiving weekend at Kohls was one of the most challenging I’ve ever had. No one wants to be working on Black Friday, much less on Thanksgiving day itself. Some of us would rather be spending time with our families. The rest would rather be out shopping getting the mega deals for ourselves. It would be easy to add to the chorus decrying the deplorable business practices of companies who open their doors on Thanksgiving, basically forcing employees who need the cash and want to keep their jobs to spend time away from their family. The problem is Thanksgiving sales make money – why else would companies keep doing it? You and I may not like the idea of it. Yet despite a few companies pledging to keep their doors closed on the holiday the practice is only going to get more popular in the years to come. So instead of blasting corporations for their questionable business practices, let’s try to change the culture from the inside. If you’re working on Thanksgiving or anytime around the holidays, here’s a radical piece of advice: be thankful. I’d love to blame my bad attitude when I worked on Thanksgiving on the corporate braintrust who opened the store or the customers who came in the door. Really though I think the problem was with myself. All circumstances. That includes, whether we like it or not, being thankful while working a shift no one should ever have to work. But how? How can you give thanks for something you’re not really grateful for? To do so you have to take a minute to step back from your anger and reflect on your situation. Instead of viewing your holiday shift as a burden, look at it as an opportunity. Shopping on these days can be demoralizing and exhausting not just for the workers but for the customers too. Holiday sales tend to bring out the worst in humanity. Rather than add to the misery with a frown on your face and an attitude of annoyance, encourage the customers who come in your store. Make them smile if only for a moment. Be patient with them. Pay them a compliment. Let them know about a discount or a coupon they might be missing out on on. Move beyond the script you normally recite when ringing up a sale and try to make an honest human connection for a few seconds. When they get upset about an item being out of stock or the way you wrap their Christmas ornament up, turn the other cheek. Let their frustrations and bad attitudes roll right off your back. Be thankful for each interaction you get to have with a customer. Trust God is using you right where you are, even if you wish you weren’t there. The problem of working on Thanksgiving day is going to get worse before it gets better. I can honestly envision a world in the near future where having Thanksgiving day off is more of a rarity than it is commonplace for most of the workforce. You may not be able to change the practice of working on Thanksgiving. But you can change the culture surrounding it. Don't ask, "why is this happening to me?" Instead ask, "Why is this happening FOR me" In every difficulty are hidden treasures. If you’re on the floor of a department store this Thanksgiving weekend, know that God is using you on the frontline of a holiday battle. Instead of seeing yourself as the victim view your self as a warrior armed with the weapon of gratitude and the ability to influence every person you interact with. Believe that even though you don’t want to be there, you’re there for a reason. Instead of voicing complaints, give thanks in every circumstance – including the ones you’re not excited about.